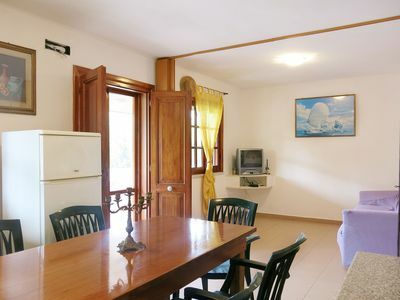 Villa Davide N: A welcoming apartment in the characteristic style of the Tuscan countryside, with Free WI-FI. 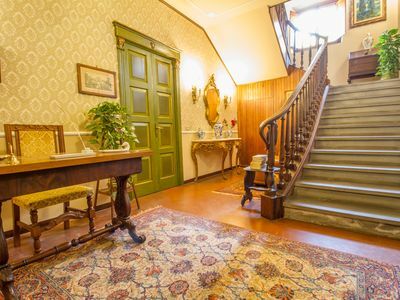 Villa Davide N is a welcoming apartment in the characteristic style of the Tuscan countryside. It sleeps six people. 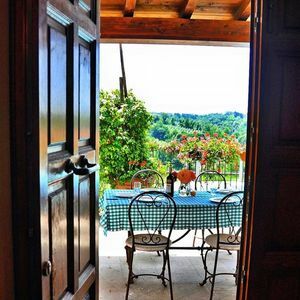 From Villa Davide N you will enjoy a nice view of the Tuscan countryside. 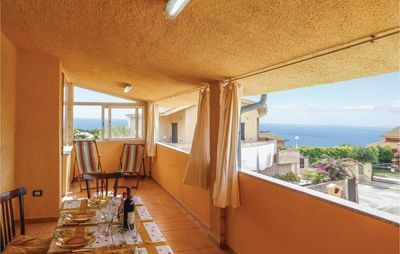 Villa Davide N is 70 square meters (750 square feet). 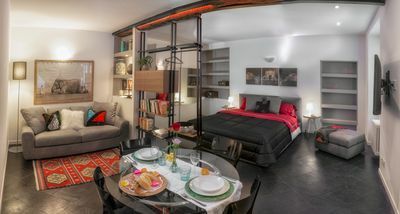 It features a shared swimming pool, a private terrace, a shared garden, air conditioning (please read description below to check in which rooms the units are installed), winter heating and WI-FI Internet access. 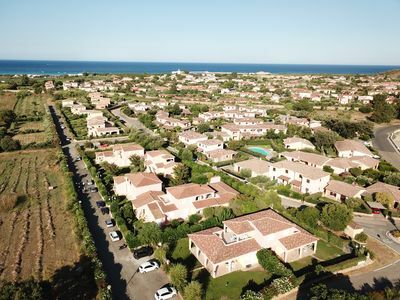 You will be roughly 3 km (1.8 miles) from Chiusi, where you will find restaurants, shops and public transportation. You will find a grocery store at 1 km (roughly 1100 yards). 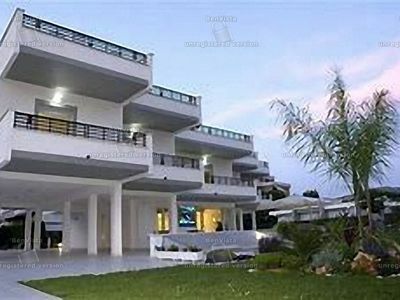 Villa Davide N is located on the first floor. You will reach it going up approximately 20 stairway steps. 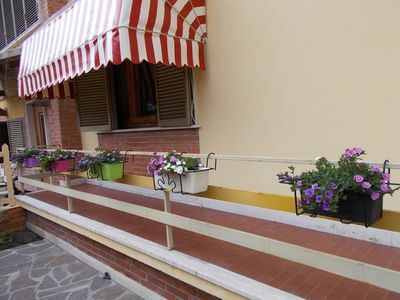 To stay at Villa Davide N you will need a car. You will be able to park it at approximately 50 meters (165 feet), free of charge in a parking lot. 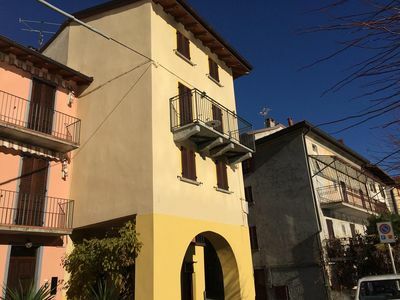 Villa Davide N is one of the holiday homes available in a small complex (you can find these holiday homes on this website). Please find a general description of the complex below, and please scroll further down for a description of Villa Davide N.
The Villa Davide apartments are located in a tiny hamlet consisting of a large and elegant Nineteenth-century house surrounded by an old garden, a small church, and three rural properties which have been restored and turned into vacation homes. Around such gracious groups of buildings, typical of the Tuscan countryside, you will see a wide stretch of enthralling verdant hills. 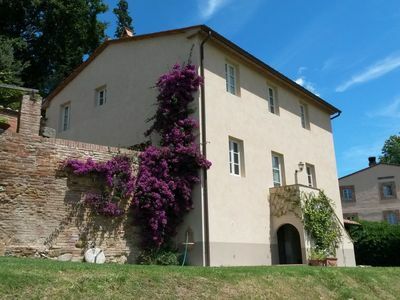 You will be in the countryside area between Siena and Chiusi, where the landscape boasts a succession of low hills which are spread as waves in an ocean green: it is the most typical and photographed scenery of Tuscany. You will also be in the heart of the ancient reign of the Etruscan, the mysterious people who ruled the Mediterranean before the Romans: Etruscan tombs can still be found under the hills in the surroundings. The hamelet has been divided in seven small vacation apartments which share the garden and the swimming-pool. The garden, 2000 square meters (21500 square feet) large, is fenced. 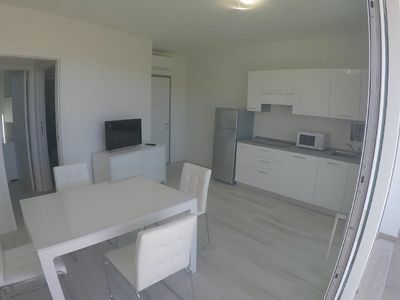 You will find tables and chairs to each apartment. You will also have a barbecue at your disposal. The swimming-pool is in a fenced and separated area from the garden and the apartments. It is beautifully round shaped, and you will find a sun-drenched area furnished with umbrellas and sun loungers around its edge. 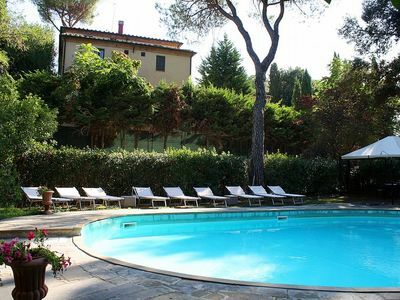 The swimming-pool is surrounded by a green lawn area and a 1500 squar meters (about 16150 square feet) woody area with trees under which you can pleasantly relax outdoors. The swimming pool is 9.5 meters (31 feet) large by 15 meters (50 feet) long. The swimming pool has a circular shape. 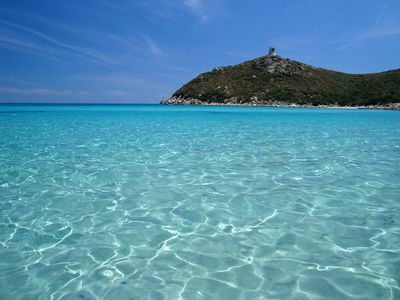 The area is equipped with tables, chairs, sun umbrellas, deck chairs and sun loungers. From the swimming pool you will enjoy a pleasant view of the surrounding countryside. You will share the pool with the other guests staying at the complex. The swimming pool is open from mid-May until mid-October. The garden is 2000 square meters (21500 square feet) large. It is partly shaded by trees. It is equipped with tables, chairs and sun umbrellas. Here you will also find a barbecue. 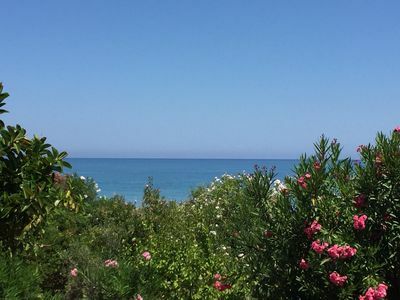 From the garden you will enjoy a fascinating view of the surrounding countryside. You will share the garden with the other guests staying at the complex. The terrace is 7 square meters (75 square feet) large. It is equipped with a table, chairs and a sun umbrella. From the terrace you will have a pleasant view of the garden. 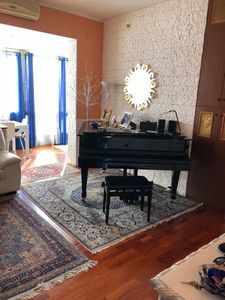 The living room is paved with terracotta tiles. The ceiling has characteristic exposed wood beams. 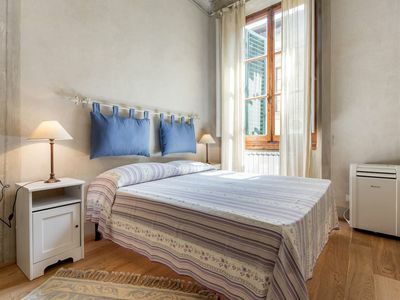 The furnishings are in the traditional style of the Tuscan countryside. The furnishings include a divan that unfolds into a double bed. There is a fireplace made of stone. In the living room you will also find a cooking area. 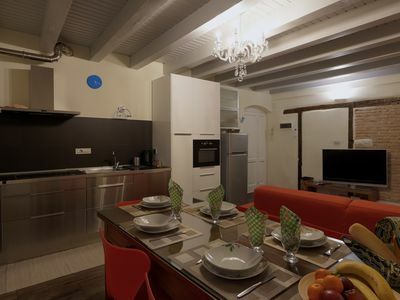 The kitchenette is equipped with a four-burner gas cooker, a refrigerator with freezer, a dishwasher, an Italian-style coffee-maker and a kettle. The dining table can accommodate six guests. From the living room you will be able to enter the patio through two French doors. 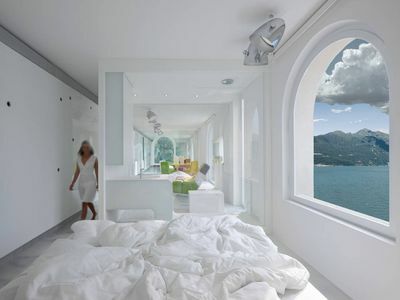 The room also has two windows. It is equipped with an air conditioning/heating unit. The first bedroom is paved with wood. The room has a matrimonial bed (160 cm/62 inches, wider than a queen-size bed). The room has a window with a view of the garden. The bedroom is equipped with an air conditioning/heating unit. 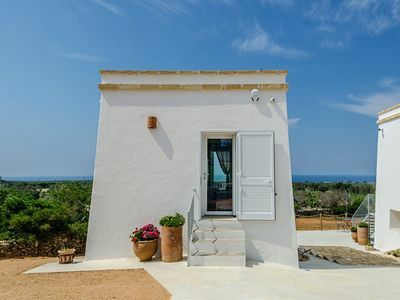 This bedroom has an en-suite bathroom, equipped with a washbasin, a toilet, a fully enclosed shower and a hairdryer. The second bedroom is paved with wood. The room has a matrimonial bed (160 cm/62 inches, wider than a queen-size bed). The room has a window with a view of the garden. The bedroom is equipped with an air conditioning/heating unit. 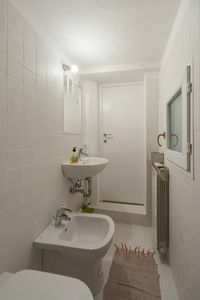 This bedroom has an en-suite bathroom, equipped with a washbasin, a toilet, a fully enclosed shower and a hairdryer.